miauu's Live Measure Pro provides several options for measuring various aspects of your scene - distances, areas, lengths, angles, sizes, axis difference, volumes, radius, diameter. Each measurement can be controlled separately. Export all measurements as a .txt file. Add custom notes to each measurement. Display custom text in the viewport for each measurement. Manual update or update in real time. 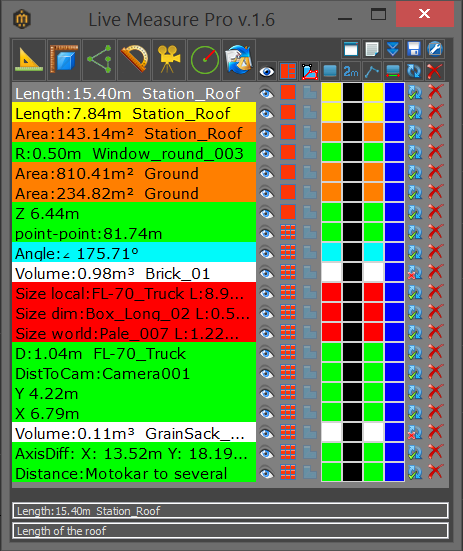 User defined colors and captions for the measurements. The measurements are always facing the viewport/camera. Can keep track of your dimensions. Save and Load all measurements with your scene. This will saves you time and the time of your colleagues. In 3ds Max 2009, 2010, 2011 the measurements in the viewport can flicker. In 3ds Max 2009, 2010, 2011, 2012 the special signs as degree, angle may not be shown properly. 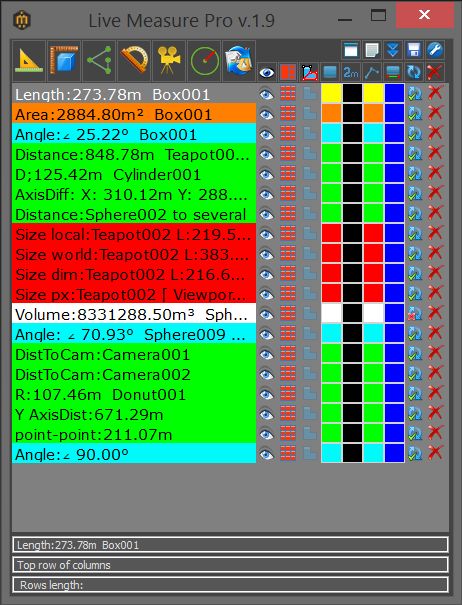 In 3ds Max 2009, 2010, 2011, 2012 the Area and Volume will be shown as "m2" for square meter and "m3" for cubic meter. In the .txt file with exported measurements some of the special signs as cubic meter, square meter, angle will not be shown properly. The measurements, that are visible in the viewport can't be rendered. If you use 3dsMax/Design 2012, please write this in Instructions to merchant field, because for that 3dsMax version, I send a slightly different version, than for the other supported 3dsMax versions. miauu's Live Measure Pro End-User License Agreement ("EULA") is a legal agreement between you (either an individual or a single entity) and KOSTADIN KOTEV for the miauu's Live Measure Pro software product(s) identified above which may include associated software components, media, printed materials, and "online" or electronic documentation ("SOFTWARE PRODUCT"). By installing, copying, or otherwise using the SOFTWARE PRODUCT, you agree to be bound by the terms of this EULA. This license agreement represents the entire agreement concerning the program between you and KOSTADIN KOTEV, (referred to as "licenser"), and it supersedes any prior proposal, representation, or understanding between the parties. If you do not agree to the terms of this EULA, do not install or use the SOFTWARE PRODUCT. KOSTADIN KOTEV grants you the right to install and use copies of the SOFTWARE PRODUCT on your computer running a validly licensed copy of the operating system for which the SOFTWARE PRODUCT was designed [e.g., Windows XP, Windows ME, Windows Vista Windows 7, Windows 8, Windows 10]. KOSTADIN KOTEV may provide you with support services related to the SOFTWARE PRODUCT ("Support Services"). Any supplemental software code provided to you as part of the Support Services shall be considered part of the SOFTWARE PRODUCT and subject to the terms and conditions of this EULA. Without prejudice to any other rights, KOSTADIN KOTEV may terminate this EULA if you fail to comply with the terms and conditions of this EULA. In such event, you must destroy all copies of the SOFTWARE PRODUCT in your possession. All title, including but not limited to copyrights, in and to the SOFTWARE PRODUCT and any copies thereof are owned by KOSTADIN KOTEV. All title and intellectual property rights in and to the content which may be accessed through use of the SOFTWARE PRODUCT is the property of the respective content owner and may be protected by applicable copyright or other intellectual property laws and treaties. This EULA grants you no rights to use such content. All rights not expressly granted are reserved by KOSTADIN KOTEV. KOSTADIN KOTEV expressly disclaims any warranty for the SOFTWARE PRODUCT. The SOFTWARE PRODUCT is provided 'As Is' without any express or implied warranty of any kind, including but not limited to any warranties of merchantability, noninfringement, or fitness of a particular purpose. KOSTADIN KOTEV does not warrant or assume responsibility for the accuracy or completeness of any information, text, graphics, links or other items contained within the SOFTWARE PRODUCT. KOSTADIN KOTEV makes no warranties respecting any harm that may be caused by the transmission of a computer virus, worm, time bomb, logic bomb, or other such computer program. KOSTADIN KOTEV further expressly disclaims any warranty or representation to Authorized Users or to any third party. In no event shall KOSTADIN KOTEV be liable for any damages (including, without limitation, lost profits, business interruption, or lost information) rising out of 'Authorized Users' use of or inability to use the SOFTWARE PRODUCT, even if KOSTADIN KOTEV has been advised of the possibility of such damages. In no event will KOSTADIN KOTEV be liable for loss of data or for indirect, special, incidental, consequential (including lost profit), or other damages based in contract, tort or otherwise. KOSTADIN KOTEV shall have no liability with respect to the content of the SOFTWARE PRODUCT or any part thereof, including but not limited to errors or omissions contained therein, libel, infringements of rights of publicity, privacy, trademark rights, business interruption, personal injury, loss of privacy, moral rights or the disclosure of confidential information. Buy miauu's Live Measure Pro for €6. In the next 24-36 hours you will receive an email with download instructions to the email used to purchase. kostadinkotev 14 юни 2014 г., 14:12 ч.
Alexander(...91@vodafone.de), please send me an email to miau_u@yahoo.com. George Nicola 30 август 2014 г., 13:25 ч.
I've following your work from the begining, you are good! 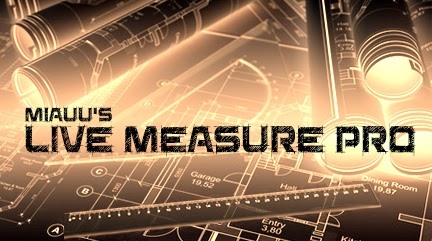 I will buy one copy from measure tool. kostadinkotev 30 август 2014 г., 13:38 ч.
Anton Gladyshev 18 септември 2014 г., 19:43 ч. Does this script allows to measure angle between two polygons? Thank you! kostadinkotev 19 септември 2014 г., 13:02 ч.
Direclty - not. You can turn On Snap On Face Center and then measure the angle between faces. But this can be added to the script. By "angle between two polygons" your mean the angle between their normals? Or you mean something else? Anton Gladyshev 19 септември 2014 г., 22:03 ч. Yes, between their normals. With Snap Center it`s inconvinient(. I need to measure between two polygons in case that it`s polygons of different Editable Polys. kostadinkotev 20 септември 2014 г., 0:25 ч.
OK. I will add this to the next version of the script. fajar 27 септември 2014 г., 5:42 ч. Point to point measure didnt updated when I move the object . Also miauu, can you make the web completly english , I see in this box comment still in russian or so , please could you change that. kostadinkotev 27 септември 2014 г., 14:26 ч.
P2P measure not works because when you use SNAP to pick points of boundingbox there is no faster way to get the object which bbox you use. Because of this p2p is only static. I will try to make a workaround. Can you send me mail to miauu_u@yahoo.com, so when the test version of the modified LMP is ready I can send it to yo for testing. About the comments on russian and other languages - I can't stop anyone to write in language he wants. fajar 3 октомври 2014 г., 12:16 ч.
another thought: instead minimize n close how about adding hide dialog , with that I can have clean max UI but live measure didnt disappear , macroscript [live measure] must detect the window hide or not , so I can unhide or hide it using it. kostadinkotev 8 октомври 2014 г., 15:26 ч.
fajar 8 октомври 2014 г., 18:04 ч. How about my idea about the dialog idea? is it doable? Anton Gladyshev 13 октомври 2014 г., 13:46 ч.
phamiliar 3 септември 2015 г., 1:47 ч.
Hello, I'd like to know if I can explort the list of the measurements out to a comma delimited file. kostadinkotev 3 септември 2015 г., 1:59 ч. No. This is not included as an option. Can you send me a sampe files, one file with measurements as they are in the LMP UI, and the comma delimited file. I can try to add this option to the script. kostadinkotev 3 септември 2015 г., 2:00 ч.
Ravi 12 март 2016 г., 9:00 ч. Unknown 20 май 2016 г., 2:02 ч.
hey, how many workstation can i install the script? Kostadi Kotev 20 май 2016 г., 2:12 ч.
Çağatay Köroğlu 17 юни 2016 г., 1:07 ч.
Luis Yacupoma Aguirre 17 юни 2016 г., 17:16 ч.
Saludos, te envie el dinero, ya te escribir a tu correo, por favor revisalo. Greetings, send you money, and you write to your email , please check it. kostadinkotev 17 юни 2016 г., 19:54 ч.
filippo rotatori Radiosity 5 февруари 2017 г., 12:41 ч. The best script for architect for 3ds max!!!!!! I am an instructor and vfx rendering, and you always do a lot of publicity! kostadinkotev 5 февруари 2017 г., 20:55 ч.
Aivars Ivanovs 12 юни 2017 г., 9:57 ч.
Hi, is there any option to make text size in viewport a bit bigger? miauu 12 юни 2017 г., 22:14 ч. No. The size of the text can't be changed. This is limiattion inside 3dsMax. Анонимен 15 ноември 2017 г., 15:11 ч. Is it possible to render with dimensions? Unknown 6 октомври 2018 г., 2:36 ч. Does this support inch and feet? miauu 14 октомври 2018 г., 21:50 ч. Yes, but since I use metric units I can't tell you which measurements will work properly with inches and feets. filippo rotatori Radiosity 9 декември 2018 г., 9:27 ч.
Kostadin Kotev 2018. Предоставено от Blogger.